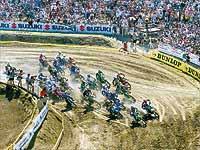 The 2002 Motocross des Nations will take place at the Compitition Park circuit at San Jacinto, California on September 29. The event, know as the Olympics of motorcross features some of the best off-road riders in the world competing in teams of three for national glory. Last year the British team of Stephen Sword, Kurt Nicoll and Carl Nunn finished fourth, behind winners France, Belgium and New Zealand. 1) Each country can enter three riders 2)Each rider can ride whatever motorcycle he wants (125, 250 or 500) 3)No more automatically qualified countries 4) Maximum 24 teams qualify for the Sunday program 5) Semi-Final 1 & 2 will be 30 minutes + 2 laps 6) In each Semi-Final the two best results of each country will count 7) Nations placed one to six qualify for the A-Final 8) Nations placed seven to 12 qualify for the B-Final 9) A-Final (30 minutes + two laps, max. 36 riders) 9) B-Final (30 minutes + two laps, max. 36 riders) 10) In the finals, the two best results of each nation will count.